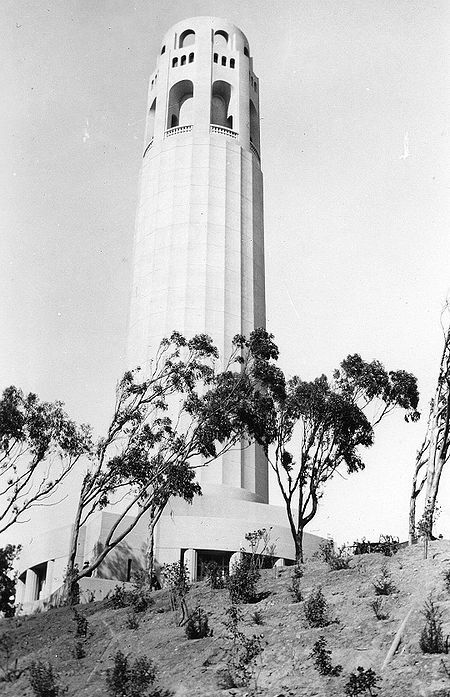 Coit Tower soon after its construction in the mid-1930s. However, when Worsely presented the nuts and bolts of his proposal to the Recreation and Park Commission, it was rejected as not viable. 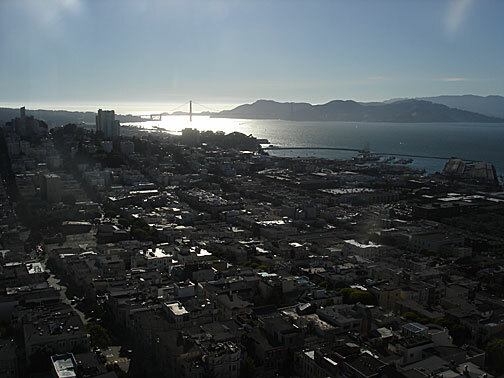 Instead the commission is considering the application of Coit Partners LLC. Worsely has a website: SaveCoit.org. Here are some facts from Worsely’s application for National Historic Site status that may be new to readers. 1. 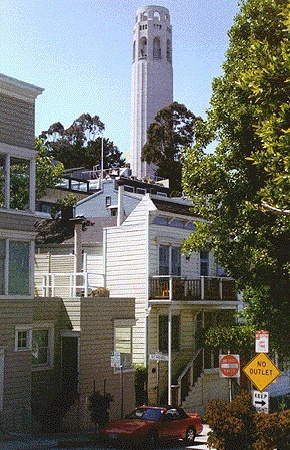 There are at least five “official” names for Coit Tower. 2. 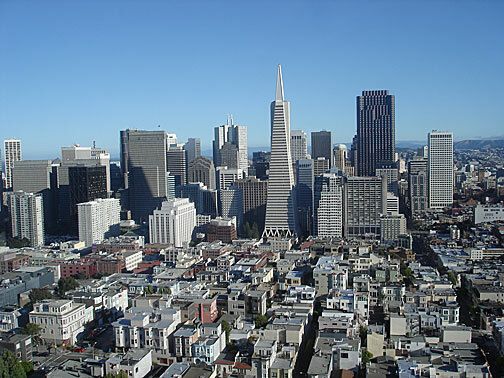 The tower is constructed of three concrete cylinders one inside the other. 3. 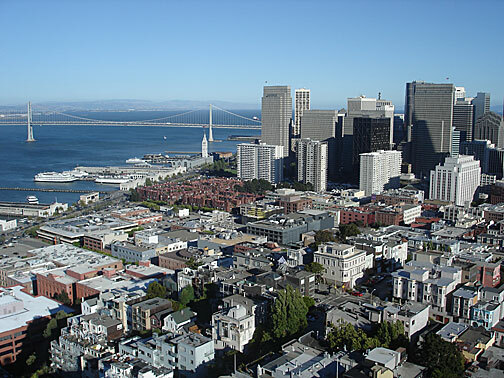 The tower was constructed between 1932 and 1933, as a memorial to the volunteer firemen who died in the five major fires in San Francisco history. 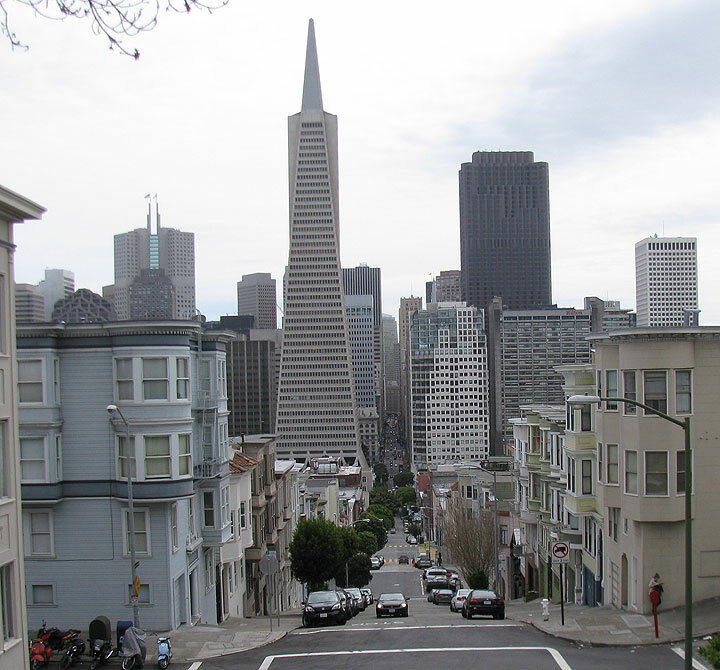 But, as we locals know, the fluted tower was not constructed to resemble a fire hose. 5. 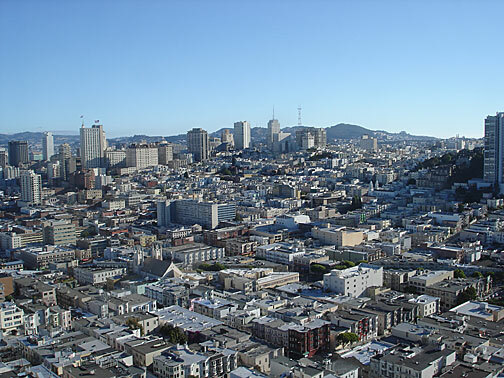 In planning for the rotunda murals, space was allotted to the 26 participating San Francisco artists on the basis of their reputations. 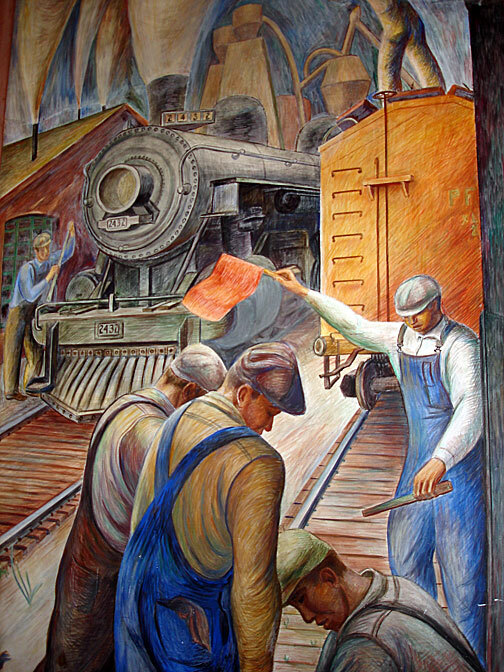 The most well know artists worked on 10’ x 36’ sections and lesser known artists received 10’ x 4’ sections. 6. There are murals on the presently inaccessible second floor of the tower. These murals were executed by the so called “Ivory Tower Group” whose work tended toward the sentimental and nationalistic. 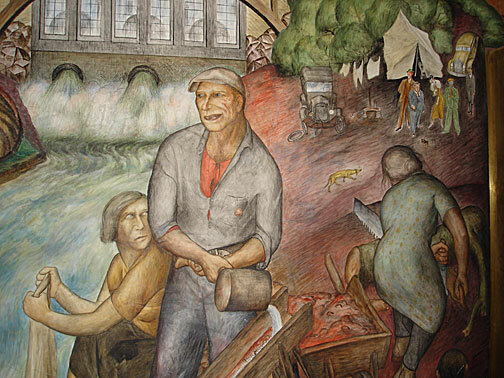 This work contrasted sharply with the social realism of the rotunda artists whose work called attention to effects of the prolonged Great Depression and offered a radical response. 7. Because the tower’s stairwell has been off limits for many years, visitors are not able enjoy the frescoes of Lucien Labaudt which depict scenes of Powell Street in 1934 using all familiar faces. Labaudt’s work may be enjoyed today at The Beach Chalet on the Great Highway. 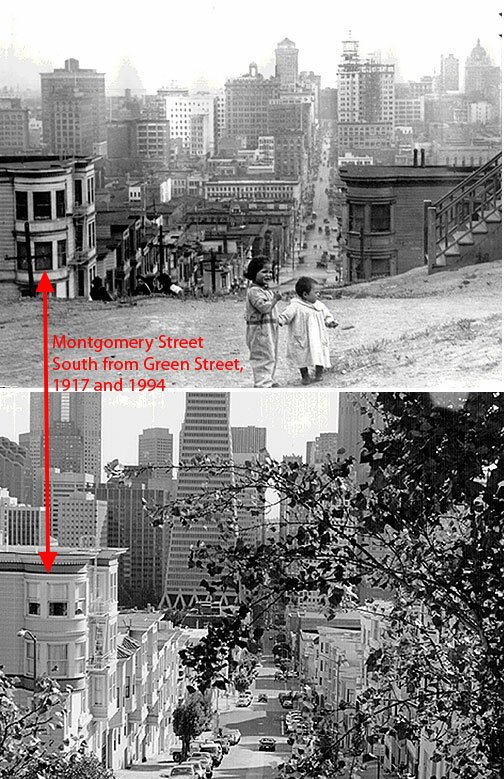 A juxtaposition of photos from the same spot, taken in 1917 and 1994, at Montgomery Street and Green Street... as you can see the exact spot where the photo was taken in 1917 no longer exists and is now air space! 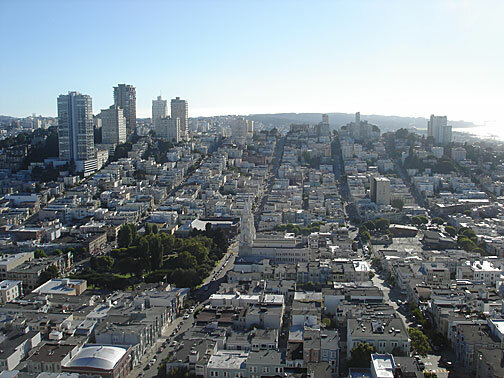 Same view southward on Montgomery from the stairs above Green Street, 2013. 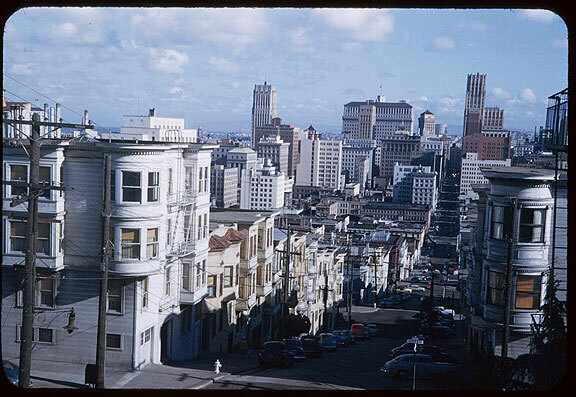 Different angle of same view down Montgomery southward from Telegraph Hill, May 23, 1953. 8. 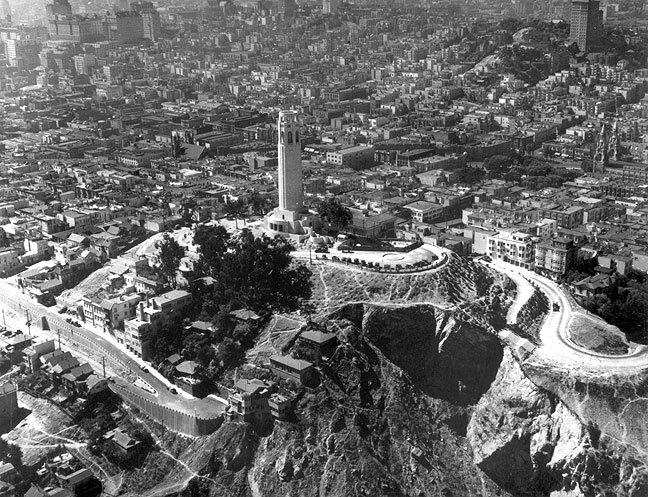 The road, esplanade, terrace balustrade and parking lot at the top of Telegraph Hill were improvements constructed in 1923, a decade before the conception of Coit Tower. 9. Many visitors to the tower are under the impression that the murals are executed by one person. One reason for this perception may be that the pigments for all the frescoes were ground by one person, artist-assistant, Farwell Taylor. 10. 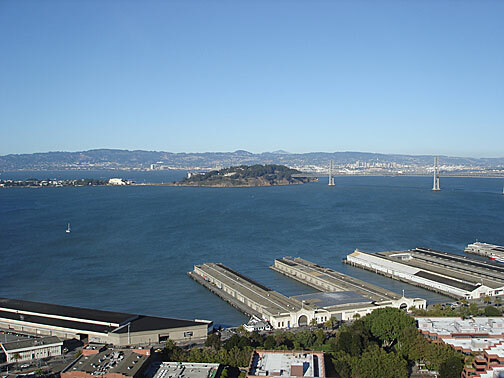 The tower was closed for a while in 1934, when the San Francisco Art Commission objected to what were described as Communist symbols in Clifford Wight’s Surveyor and Steelworker. 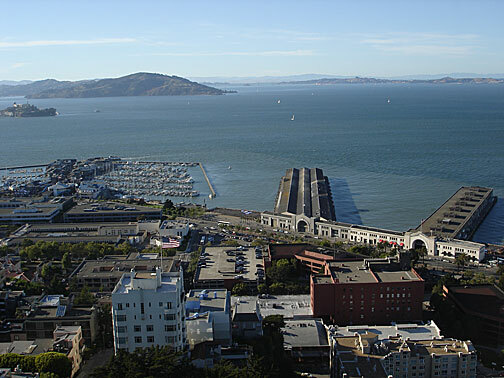 The Artists’ and Writers’ Union picketed to protect the murals from being destroyed, but during the time the local newspaper headlines were devoted to the settlement of the longshoremen’s strike of 1934, the symbols were quietly removed and the tower reopened on October 20, 1934.